If Shrimp and Grits married Sausage Gravy this would be their baby. If you prefer grits over biscuits, go ahead! A touch of cream gives this classy sauce a velvety texture. 1. Shell and deveign the shrimp, reserving the shells, and place the shrimp on a paper towel lined plate to dry. Cut the shrimp into bite sized pieces. Gently toss in a bowl with 1/2 tsp of the Creole seasoning and refrigerate. 2. In a small saucepan, stir the remaining 1/2 tsp of seasoning into the milk. Add the reserved shrimp shells. Over medium heat, warm the milk until small bubbles appear around the edges of the pan and the milk is very hot but not boiling, stirring once or twice. Cover the pan, turn off the heat, and allow the shells to steep 15 to 30 minutes. 3. If you are baking your biscuits from scratch use this time to assemble the biscuits, but you may not want to bake them yet. You want the biscuits hot out of the oven when ready to serve. 4. Remove the shrimp from the refrigerator and set aside. 5. Using a wire sieve, drain the milk into a two cup or larger measuring cup or a bowl. Discard the shrimp shells and add enough cream, (about 1/4 cup), to the milk to make 2 cups. 6. Cut the sausage in half lengthwise, then slice into 1/4 inch half moons. 7. In a large, heavy skillet, heat the oil. Add the sausage and saute until lightly browned. With a slotted spoon or spatula, remove the sausage to a plate, reserving the drippings in the skillet. 8. In the same skillet, cook the shrimp until they just begin to color. You do not want them cooked through at this point. Remove the shrimp to the plate with the sausage. 10. Add the diced bell pepper to the skillet and give them a minute to cook before adding the white and light green portions of the sliced green onions. (Reserve the dark green onion tops for garnish.) Cook until the peppers are just beginning to soften, stirring occasionally. 11. Add the butter to the skillet, and when the butter has melted stir in the flour. Cook, stirring constantly, for 2 minutes, then gradually stir in the milk. Return the sausage and shrimp to the pan. 12. Cook and stir until the gravy has thickened to your liking. By then the shrimp should be cooked through. 13. Place two biscuits on each individual plate. 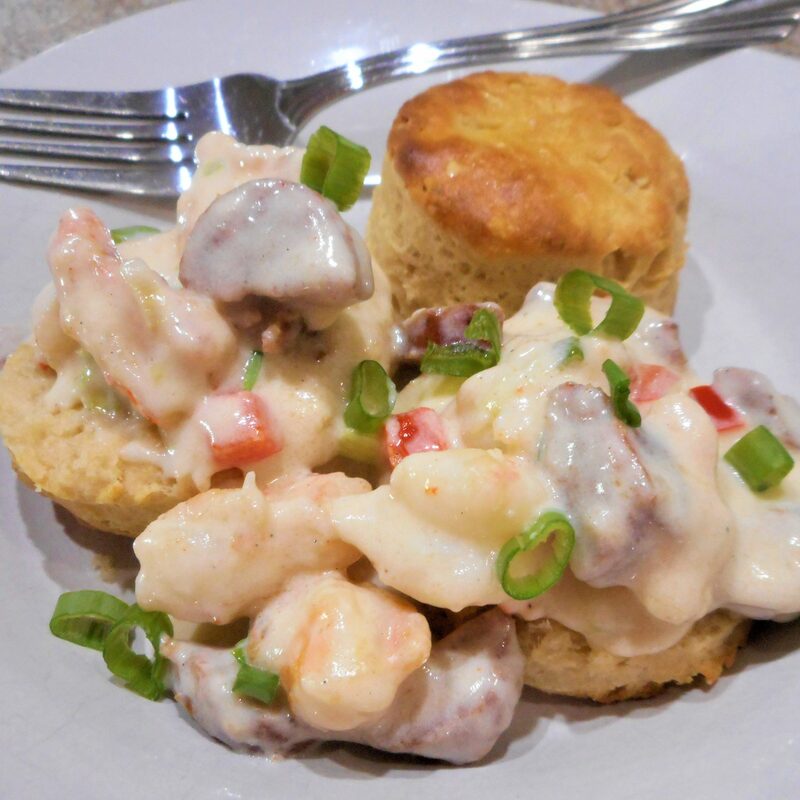 Split the biscuits open and spoon the hot shrimp and sausage gravy over each portion. Garnish with the sliced green onion tops. Serve immediately.